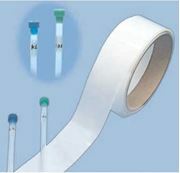 A self-adhesive clear transparent label ideally suited for labeling 5mm OD NMR tubes. Furnished on a roll, the labels are convenient for hand-writing identification information. The label length allows for extra wrap-around to protect the descriptive information from rubbing off. Tube balance is also maintained for proper spinning quality. The ½” width gives ample space for descriptive information. There are 500 labels / roll.